While Englishmen and Englishwomen nearly always seem negligent in their dress, especially in Paris, where they successfully get past all the airs in toilette and parure which overwhelm us and hold us ceaselessly in a reserved or stiff composure, they have nonetheless their own most formal dress, or Court dress. It is perhaps more curious than useful to present it, since in this Foreign country we wear French dress, but we do not believe that people will be totally indifferent, if only to establish the comparison between the dress of Ladies of the London Court and that of the Ladies of the Court of Versailles, that we have drawn in the twentieth Book of the 1st Year. The Englishwoman represented in PLATE I wears a Court dress. The bodice of this gown and the sleeves are of a green satin. One of the sleeves is shown puffed and bound with a ribbon, and the other is plain, so that one can choose. The mantua is of pink satin. This part is pulled up in drapery in front, and bound in drapery on the sides as well. Under this gown, a petticoat of green satin, trimmed with a flounce of white gauze, with bows of pink gauze and little bouquets of artificial flowers. On the neck, a full gauze kerchief with large squares, and on the side, a large bouquet of artificial flowers. This Englishwoman's tapet is frizzed, without any curls, and her hair hangs à la Conseillère. 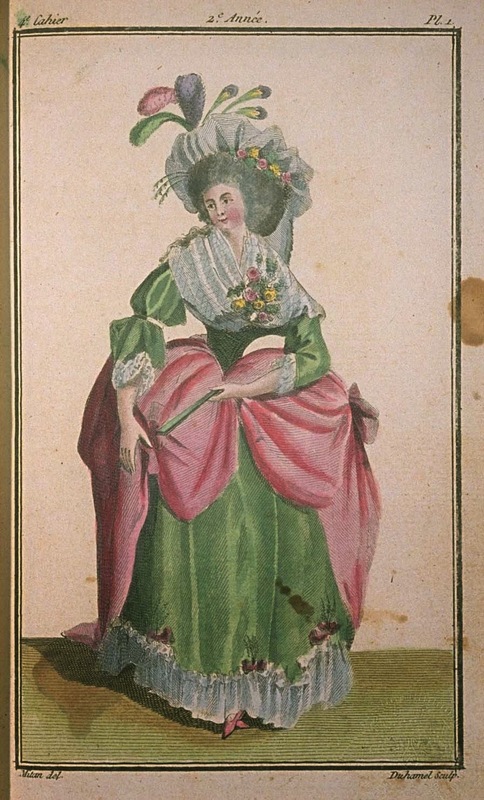 Her hair is decorated with a bouquet of artificial roses which descends on the left side, a little aigrette of greenery which descends on the right side, and a coiffure of white gauze with little stripes, surmounted by three peacock plumes and three large pink, violet, and white plumes. Her shoes are of pink satin, flounced with a white ribbon. Her hands are covered with white leather gloves, and in the right she holds a fan.